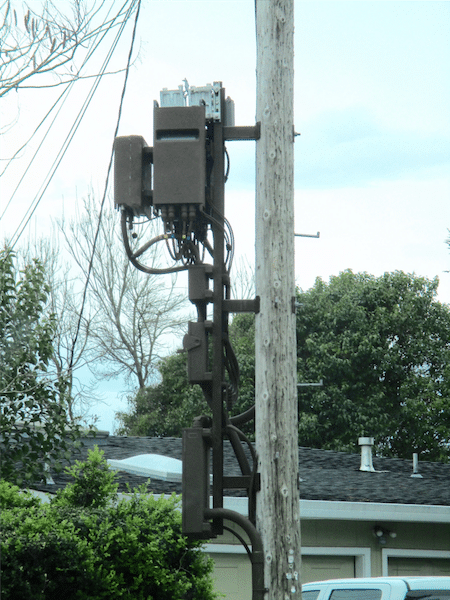 How would you like this ‘mini’ cell tower parked outside your front door or your bedroom window or on a pole in your backyard? And you cannot have it removed, thanks to the U.S. Federal Communications Commission! That little monster will pump out 5G wireless networks at speeds consumers literally may die for, as the amount of microwaves 5G will be pumping out will be ‘astronomical’—anything in the ranges from 6 GHz to 100 GHz and higher! Consumers, high tech addicts and microwave tech aficionados—here’s something you probably don’t know nor care to know about right now other than your apparent ‘need’ for faster downloads, but you had better become acquainted with since it definitely will impact your life—maybe more dramatically than your not having high-speed Wi-Fi! Consumers need to understand and also factor into their consciousness certain reproducible facts about microwave technologies, especially that microwaves are not natural energies produced by Nature; they are man-made human-tissue-debilitating energy waves that impact all bodily functions and tissues, whether you believe that or not, since any type of energy produces effects! Currently, I am working on producing an ‘anthology-like’ article containing verified factual research regarding microwave damage to human physiology at much lower levels of exposures than 5G, which may astound readers. It will be quite a resource to have, so look for it. The KEY issue to understand regarding microwaves is the velocity at which they oscillate per second! The “G’s” refer to the latest generations of microwave technology, most of which operate in the Gigahertz (GHz) ranges. As we read above, 5G will operate in the 6 GHz to 100 GHz – and above – ranges! One Gigahertz (GHz) is one billion oscillations per second! Now do some math and see if your calculator has enough capacity to give you an answer. Multiply 6 GHz by one billion; what do you get as oscillations per second? Multiply 100 GHz by one billion and what do you get? Research and studies published in respectable peer review journals indicate grave concerns for what can happen at DNA and cellular levels, especially to the human brain because of its water/fat content and human eyeballs, which have a similar tissue consistency as the human brain! Currently, ocular melanomas  are occurring in college students, which has medicine stumped  as to why such an ‘anomaly’ is happening. Well, it probably is happening because colleges and school premises often are dotted with cell towers and other high tech antenna arrays (paying ‘nice’ monthly rental fees), which impact human tissue, especially in the young. Medical ‘science’ seemingly refuses to accept non-thermal radiation damage due to consensus BS science put out by various microwave industry trade associations who basically act like “tails wagging dogs” with regard to non-thermal radiation adverse health effects. They claim there is no such thing as “non-thermal radiation adverse health effects”! Well, I suggest doubters go back to the research the microwave industry funded and performed wherein they found 32% of their research studies confirmed non-thermal radiation adverse health effects, and still the trade associations will not accept it. Why? Because admitting that would require such inordinately expensive safeguards be put into place, the cell phone industry and other microwave industry suppliers and operators could not afford them and probably would be put out of business! Here http://www.seattlemag.com/article/uw-scientist-henry-lai-makes-waves-cell-phone-industry is some information about Dr. Henry Lai’s [PhD] work, which ought to get high tech consumers thinking about just how important it is to have high-speed 5G Wi-Fi at work, in your home and at the nearest café. Right now as consumers read this article, they are not aware of all the Gigahertz oscillations they constantly are being exposed to from any wearable tech, cell phones, AMI Smart Meters, LAN or HAN networks, or any products or services that send and/or receive voice, data, photos, etc. 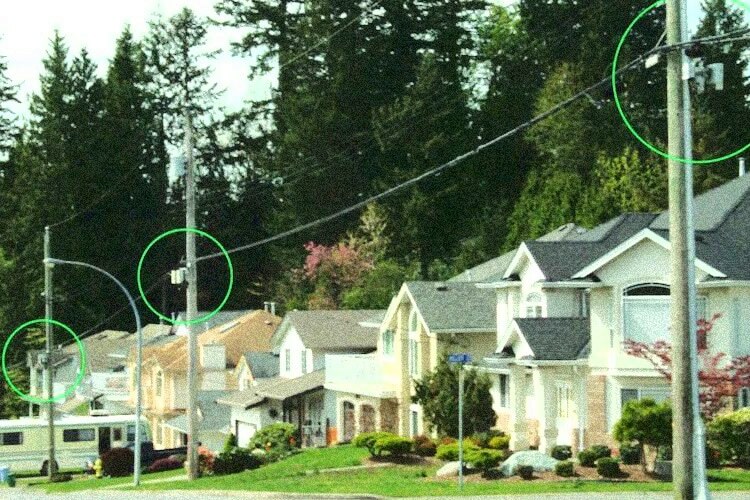 However, I’d like to bring to your attention Verizon has done an about face with regard to installing 5G “small cell towers” in Sebastopol, California. Loss of property value due to having one of those junk yards outside, or on your property, is something everyone needs to consider seriously, i.e., is faster Wi-Fi downloads worth the loss of thousands of dollars on your home’s value? Check out EMF’s comments in “Peer-reviewed published science shows wireless radiation harms public health” and “Proximity to RFR antennas is harmful.” Humans are not alone in the damage; readhow RFRs damage Nature! The telecommunication industry’s unbounded profit motive should never outweigh the safety and well being of the public and our environment! Communications are safer using wired and corded connections. However, that may not be what the microwave industries want as it probably will cost them megabucks for more infrastructure, something 5G small cell towers greatly reduce in costs. This entry was posted in * COURT CASE INFO, * FREEDOM FIGHTERS, * Ground Crew MESSAGES, * HUMAN LIFE INTERESTS, * INFORMATION SOURCES, * MILITARY FORCE UNITS, * NEW TECHNOLOGY INFO, * NEWS - WORLD UPDATES, - BLACK BUDGET PROJECTS, - CABAL'S LATEST MOVES, - CRIMES Against Humanity, - HIDDEN ♠ CONTROLLERS, - WARS - ON HUMANITY, AGENDA 21 ♠ EUGENICS, AMERICAN NEWS, AUSTRALIAN NEWS, ♠ NEW WORLD ORDER ♠, CANADIAN UPDATES, DEATHS OF HUMANS, E.M.P. WEAPONS, EDUCATIONAL CRIMES, Environmental Disasters, ENVIRONMENTAL Issues, EUROPEAN NEWS, FBI & CIA & Police Expose[d], GALACTIC SPACE WARS, Genetic DNA Tampering, HUMAN SACRIFICES, HUMANS in SLAVERY, ILLUMINATI DECEPTIONS, ILLUMINATI EVIL Devices, IMMEDIATE ATTENTION, INTERNATIONAL NEWS, LAW ENFORCEMENT, MILITARY - WAR MOVES, MILITARY Equipment Evil, MILITARY RESOURCES, MILITARY Secret Weapon, MIND-CONTROL HUMAN, NEW ZEALAND NEWS, Nobility - NEGATIVE ELITES, POSITIVE vs NEGATIVE, RUSSIAN NEWS, SATANIC ♠ ILLUMINATI, SMART METERS - KILL, SPACE WAR NEWS, SURVIVAL INFORMATION, TECHNOLOGY TRICKS, TECHNOLOGY WARS, UNITED KINGDOM NEWS, UNJUST FRAUD CRIMES, URGENT MESSAGES, VACCINATIONS ♠ KILL, WARS EVIL COMPANIES, WARS ON CLASSES, WHAT IS HAPPENING ?, What's Up - Dark Cabal, WORLD ♠ GANGSTERS. Bookmark the permalink.